Well here we are again..... more faces and a happy Chris because the sun is shining and oh doesn't it make you feel good! It's wonderful to have all the windows open and fresh air flowing through the house. Almost makes me feel like doing housework (not...lol) I'd rather pull my teeth out with pliers.... ooooh maybe not then. Okay so Face#11 was hand drawn but I coloured her digitally to give her some nice colour. 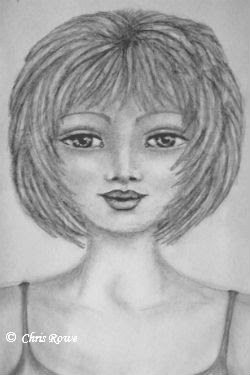 Face#12 is one I started a while back but didn't like so I did a bit of erasing and gave her new eyes and some hair. Not the best hairstyle but the paper wasn't good after the rubbing out. Serves me right for doing it in a cheap sketch book. Still she looks better than I thought she'd end up so hey ho. Back again tomorrow... hope to see you then. Hihi, same here! I was also drawing in a cheap sketchbook and did too much erasing... Remember: transparent gesso and sandpaper are the solution! That being said: I think they both look wonderful. Love the colors on the first one, and those eyes are amazing! Marvelous. 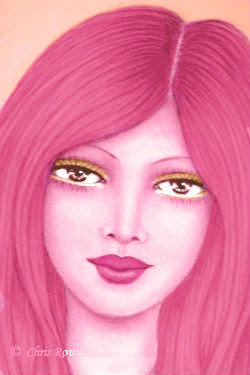 I like that you added the rose coloured hair. Wow wow wow wow two new pretty faces Chris. Your work is phenomenal. Love them all.